Ingredients: Certified USDA Organic Full Spectrum CBD, MCT Oil, Lecithin, FDA Approved 100% Organic, Biodegradable Preservative (Pureganic), Natural Flavours. Purchasing this product will earn you 50 Greenbucks! 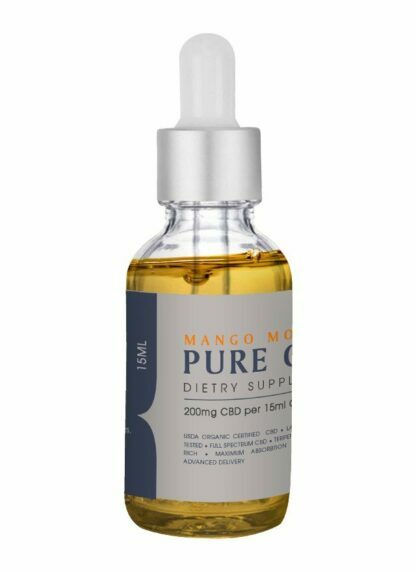 Cannaco CBD Oil Mango Monkey 200mg 15ml Cannaco CBD Oil is a clear blend of Certified USDA Organic Full Terpene Spectrum CBD, paired with MCT (Medium Chain Triglycerides), a translucent, tasteless, odorless and rapidly digested carrier oil. Experience the amazing health benefits that result from Cannaco CBD oil, which contains all natural and organic ingredients and delivers high concentrations of CBD. These products are not psychoactive, so they will not make you high. MCT Oil has antimicrobial, antibacterial and antiviral effects. It aids in weight loss, reduces appetite and promotes increased feelings of fullness. It enhances exercise performance, can help lower cholesterol, helps with diabetes, benefits the brain and has been shown to improve learning, memory, and brain processing. It protects the heart, Improves cognition, elevates mood, improves digestion, improves nutrient absorption ans supports hair and nail health. Certified USDA Organic Full Spectrum CBD, MCT Oil, Lecithin, FDA Approved 100% Organic, Biodegradable Preservative (Pureganic), Natural Flavours. Product taste masked by the flavor added so it does not have the strong weed taste that other non flavored products have.